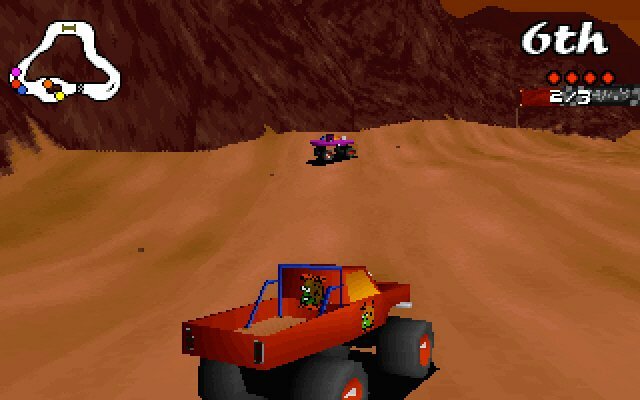 Big Red Racing was what can only be described as an open world racing game; open world because you were not actually restricted to racing on the track. Veering away from the tracks would reward you with all manner of interesting surprises that added much intrigue to this little gem of a game. If you weren’t a big fan of serious racing games, then this was potentially a game for you. As a youngster, this was the only racing game that would keep me occupied for hours at a time, a game that encouraged you to not only race, but also to take detours and did not make you feel exceptionally guilty about killing the local wildlife, namely sheep; there was just something oddly satisfying about hearing the ‘splat’ the sheep would make as you drove over them. 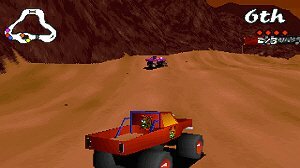 Big Red Racing was originally released for DOS in 1996 and had much to offer. You could customise your own driver and your vehicle – changing the colour and the logo of both – and could choose from a total of 24 courses over 6 cups to race in, races that not only took place on Earth, but also the Moon, Venus and Mars, making for some diverse locations to play in. There were three modes to choose from; single player, where you could choose to race a single track; a single player tournament mode in which you played 5 rounds of increasing difficulty to become the Big Red Racing Champion; and multiplayer, where you could play with up to 6 players and it was here where the most fun was to be had. The game could be played with up to 6 players via a network or the traditional split-screen with two players. The game was much more fun playing with other people and made for many entertaining moments, whether racing together or just messing around outside of the main tracks. The game offered a multitude of motors to choose from, and not just cars. You could choose from boats, trucks, moon buggies and helicopters, making up a total of 16 vehicles to race with. There were 8 groups of vehicles, each comprising of 2 different vehicles for you to choose from, depending on the type of level that you wanted to play; each race was varied and the vehicles on offer were specifically designed depending on the terrain of the selected level, whether it took place on watery tracks around China in an inflatable motorboat, through the skies of Norway in a helicopter, or around the vast planes of the red planet in a hovercraft. During a race, vehicles didn’t particularly move at the speed of light, making for some steady paced racing and this may not have appealed to those that preferred a more speedy experience. The difficulty of the game was, for the most part, based on the design of the tracks and your manoeuvring skills as opposed to relying on full speed to overtake an opponent. The controls of the vehicles also felt very floaty and the camera could also be jittery as you chugged along, though these issues certainly didn’t make the game any less enjoyable to play. The race environments themselves were not particularly thriving with colour; the graphics were blocky and levels could seem rather barren at times, but at the time of release, they would have been considered acceptable. Most of the detail was kept where needed, around the tracks, with a few trees, bridges, rivers and some buildings making up most of the scenery. The levels made up for the lack of graphics by offering lots of scope, and this is what encouraged you to take detours to find the hidden secrets; if you could see something in the distance, chances are you’d be able to drive towards it. 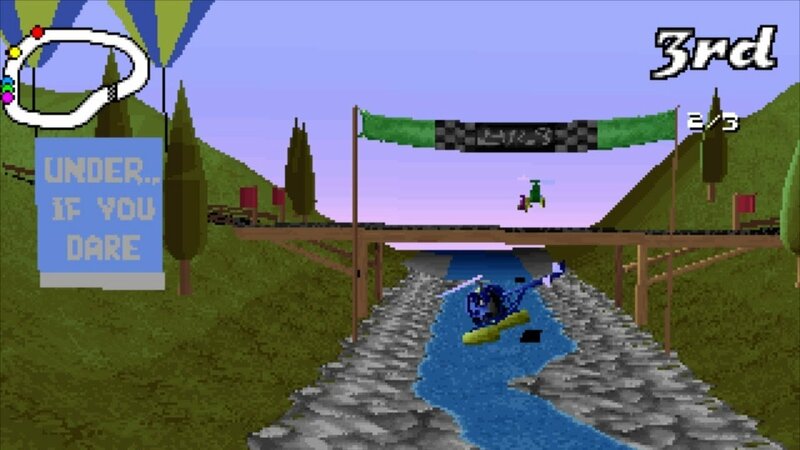 Had a player decided to take a detour, the game did not finish until you crossed the finish line, so you could spend hours exploring the different areas in which these races took place, but at the expense of losing the initial race. In any racing game the camera angle can be changed to view a race in all its glory, and it was certainly put to novel use here; the races could be replayed and whilst viewing the replay, you were able to change the camera angles to view the race, and the best angle was from that of your opponents. It was certainly a novelty being able to see your own driving progress through the eyes of your rival, making for many humorous moments as you saw your car flying across the track or down into a ditch. Favourite races could also be saved, enabling you to go back and see a race full of bloopers or view your best scores. 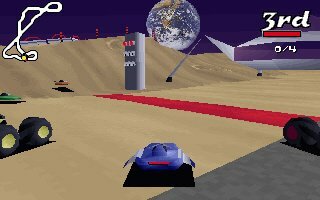 Even selecting a race was a novelty, with the menu consisting of a 3D model of the Earth, which rotated as you chose what location to play in. Depending on the location would also see the race commentated by a person themed to that location, so racing in Italy would see the race humorously commentated by a stereotypical Italian person. Race in a multitude of vehicles, including helicopters. There are no cutscenes in the game, with the focus solely being placed on the gameplay and in order to develop the characters, when you chose who you wanted to play as, there was a brief biography which included information about the character such as their name, date of birth, where they were born and, strangely, their favourite non-porous material or existential philosopher. The characters were certainly likable and more of their personality was shown during the races, where they spouted quips and colourful language as they dashed around the tracks. However, this commentary could seem rather immature and may have irked some players after a while, though thankfully there was an option to turn this off. There were a total of six characters to choose from, each with their own unique personality and they could all be customised before a race. The soundtrack is what a lot of players will remember about this game; old-school techno beats blasting out as you raced. The music didn’t particularly fit the flow of the racing, but it was varied and still enjoyable to listen to. 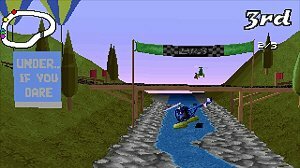 Big Red Racing was a flawed yet vibrantly quirky gem of a game, with camera issues and blocky, grainy graphics being the main problems. But with the scale of the levels, hidden secrets, the many tracks and vehicles on offer, upbeat soundtrack, humorous characters and commentary and the multiplayer, the longevity of the game could last for many hours, making Big Red Racing a big nugget of a game indeed.